Afghan President Hamid Karzai speaks during a joint press conference with NATO Secretary-General Anders Fogh Rasmussen at the presidential palace in Kabul on March 4, 2013. 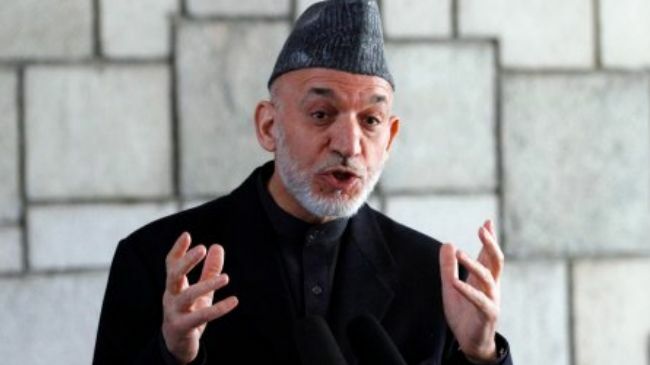 Afghan President Hamid Karzai says the US fights in Afghanistan with the intention of gaining access to the country’s underground resources, adding that Washington’s so-called war on terror is not real, Press TV reports. “Americans have asked Afghans to give them Afghanistan’s mining contracts, and I said ‘Bring your contracts’… Lots of mines are hidden in Helmand and from the start they have been doing their investigations and finishing their photography. But now they understand that we know about them,” Hamid Karzai said in a Tuesday speech during an official visit to southern Helmand province. The president went on to say that the US-led foreign forces’ so-called anti-terror war in Afghanistan is not a real one and that the Americans fight for their own interests in the country. Karzai once again slammed US double standards for holding secret talks with Taliban militants in certain Persian Gulf states and Europe. “Both Taliban and Americans drink tea and eat chocolate together, but they come and attack civilians in Afghanistan,” Karzai noted. Last month, Afghan media reported that Washington was in contact with the Taliban in Qatar to persuade the militant group to sit at the negotiating table with the Afghan government. Afghan government officials have not held direct talks with the militants since they were toppled in 2001. The Taliban have repeatedly refused to negotiate directly with the Western-backed government of President Karzai, demanding the negotiations to be held between the militants and the United States.